I’m excited to talk about innovation again as a RootsTech ambassador! 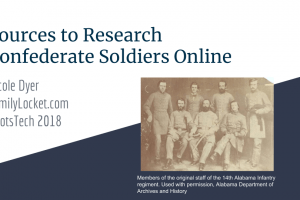 This article is about some of my favorite innovations that I learned about at RootsTech and also about the changes coming for RootsTech 2018. JRNL – I learned about JRNL at RootsTech 2016. Their online platform for keeping a journal is just what I needed to keep up with journaling. I am an email person. When I get an email, I don’t archive it until I do the task associated with it. The email reminder feature from JRNL is just what I needed! I just click “respond” and then I type in my journal entry. I just ordered my first hard bound copy of my journal after 1.5 years. It’s over 100 pages. I’m excited to see it. Little Family Tree App – I learned about this app at RootsTech 2016 also. My children (three kids under 7) love to play with it and sing the family tree song. They also like doing the ancestor photo watercolor painting! There are so many games to choose from. It works so well with FamilySearch. If you have photos of your relatives there, your Little Family Tree will import them into the matching games and other games. Kindex – This tool allows you to create searchable archives. We are using Kindex to do a family indexing project for our ancestor’s diary. We are transcribing each page. It’s really neat! Twile – This timeline tool is absolutely amazing! I loved using it to wrap up all my research about my Confederate soldier, C.B. Royston. I wrote about it here. Old News USA mobile app – I learned about this at RootsTech 2017 and I love the concept. The app help you search in the Chronicling America newspaper collection. I haven’t been doing much newspaper research lately but I’m working on a project right now that I will need to begin researching in newspapers again. I’m excited to use the tools in this app again, especially with finding all the relevant search terms on the page! I’ll admit, I’m a little sad to say goodbye to the Innovator Showdown. It was just such an exciting part of RootsTech. Watching entrepreneurs introduce their products to a group of judges is such a rush. They have to be bold, courageous, vulnerable and confident. The showdown was fashioned after the popular television show “Shark Tank” – no wonder I loved it, Shark Tank is one of my favorite shows! Have a new technology tool or feature that you can’t do genealogy without? Nominate it for the Showcase. Or Tweet us your favorite innovation using #RootsTechInnovation. 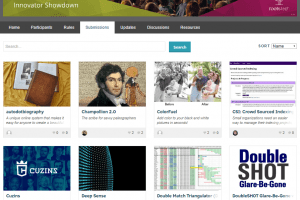 I spoke with Tyler Stahle, marketing and communications manager at RootsTech, to learn more about the change from the showdown to the Innovation Showcase. He said that a major reason they are moving away from the showdown is to include more kinds of innovation in the industry. “The Showdown was designed more for small startups or individual entrepreneurs who had built a cool app,” Tyler wrote. Don’t make your customers work – how can your technology make their lives easier? Think outside the product – innovation comes in many forms, not just products. Processes, distribution channels, customer engagement, brand, etc. After reviewing these notes, I had more ideas of innovations that are changing the industry. I asked Tyler if I could nominate large companies like Epson and Google. I love the Google Photos system with the facial recognition software, instant upload to the cloud and ability to create photo books all within their web app. Also the Epson FastFoto scanner – a scanner that digitizes both sides of photos quickly. I talked to one of Epson’s reps and they said they were at RootsTech last year demonstrating their product. I didn’t get a chance to see it because I was busy in the media center and didn’t walk around the whole expo hall. How disappointing! I actually found the FastFoto scanner on my own a couple months ago, searching for a solution to the three boxes of photos we brought home from my parents in law. With the Innovation Showcase, we will see the top innovations in the industry on the RootsTech stage. It will be great to see the big movers and shakers along with the startups who are all working to improve the family history industry. So what innovations – whether a startup, new product, creative process, or new feature of a big company – are changing the family history industry? What innovations have helped you? Share on your blog or social media with #RootsTechInnovation. And don’t forget to nominate them for the 2018 showcase by October 15! Diana and I are delighted to be RootsTech ambassadors again this year. We’ll both be giving away a 4-day RootsTech pass soon so watch for that. You’ll see one post from both Diana and I each month leading up to RootsTech as part of our ambassador responsibilities. In exchange, we receive free admission to the conference. 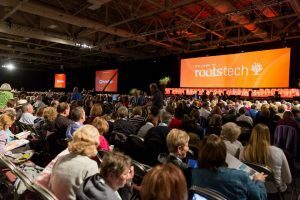 Is there anything you’d like to know about RootsTech? What should we write about? Let us know in the comments. We are also both speaking at RootsTech, which is really exciting for us. See you there! Thank you for all you do to promote, teach, and share all aspects of family history! I am constantly amazed and edified by what you give – you are an incredible source of knowledge and inspiration! I look forward to attending your classes at RT! You asked your readers to share what innovations meet the specifications you outlined, so I am sharing The Family History Guide as an innovation that meets each one. It is approved by FamilySearch and is being used in 150 countries all over the world. Read more about The Family History Guide as a nominee for the Innovator Showcase here: http://www.thefhguide.com/innovation.html You can also get to that page from this blog post: http://www.thefhguide.com/blog/rootstech-2018-innovator-showcase-game-on/ We invite you to explore the Family History Guide (www.thefhguide.com) and let us know what you think. Thanks for your kind words. We’ll look forward to meeting you at RootsTech! The Family History Guide is certainly a wonderful resource and the mission statement reflects the good that it is doing. I will definitely explore it again. I know that a lot has changed since I last used it and it’s time for a revisit. Thanks for bringing it to our attention! Great post! To be honest I will miss the separation of small startups from the big game players. I think it will make it much harder for the ideas of small entrepreneurs to gain exposure. To be honest I’m hoping that my little program, Census2Ged (https://sourceforge.net/projects/census2ged/?source=navbar) will get picked although I know the odds are slim. It basically takes subscriptions made in the tool GenScriber and saves them as gedcom files preserving as much data as possible, including relationships between nuclear families, in just a few clicks. I think its very useful for people conducting one name studies as well as people just looking to do collateral research quickly. It works with the 1880, 1900, and 1910 censuses and its free! Just realized I made a typo, transcriptions not subscriptions haha.